The Autism Together fundraising team was delighted to get into the festive spirit this week at the Cheshire Oaks Christmas light switch-on event, after being chosen as the official Christmas charity partner for the designer outlet. The Wirral-based charity was invited to switch on the lights in front of thousands of festive shoppers in the same week that it celebrates its official 50thanniversary. Founded in 1968 by local families as the Wirral Society for Autistic Children, the newly-named Autism Together now employs a thousand staff and offers services and support to people with autism across Cheshire, Merseyside and North Wales. Local boy Thomas Rimmer, 13, who has autism and takes part in many of Autism Together’s social groups for young people, was a special guest at the event, pressing the button to turn on the lights for the 2018 festive period. The Rimmer family also attend Cheshire Oaks’ autism-friendly shopping events which happen on the first Tuesday of every month. The Wirral-based charity will be based at the foot of Europe’s largest walk-in artificial tree across the Christmas period, giving advice and collecting donations for its Future 50 Appeal, which is aiming to raise £2.5million for an autism assessment and diagnostic centre. Entrance into the tree is free, however a £1 donation is suggested to help the charity’s appeal. “Everyone at Autism Together is delighted to be the beneficiary of this year’s Christmas Tree at Cheshire Oaks, particularly in this important anniversary year. Aside from the tree, there will also be a dedicated autism-friendly Christmas shopping day on 4thDecember, where you can book to have dinner with Santa in a calm and relaxing environment. Details on how to book can be found at https://www.mcarthurglen.com/en/outlets/uk/designer-outlet-cheshire-oaks/. 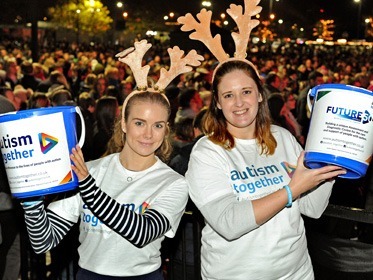 The charity is also calling for volunteers to help out across the festive period, so if you would like to help with bucket collections at the Christmas tree or at any of Autism Together’s other events, please contact chloe.jones@autismtogether.co.uk.